Typography is the art of arranging and selecting fonts. Non-designers usually don’t even know the word, let alone how to do it well. I’m not a designer, but in working with them over the years, I’ve picked up some basic knowledge. When designing anything with type, it’s been my experience that non-designers usually screw their work from the get go by choosing a fancy-looking fonts like comic sans, papyrus or an unreadable script. 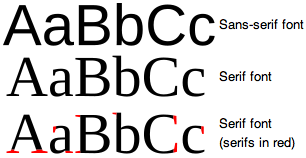 The best tip I’ve learned is to pick a simple, balanced, sans-serif font like Trebuchet or Helvetica. They are clean and simple, and as a result, they are easy to use. 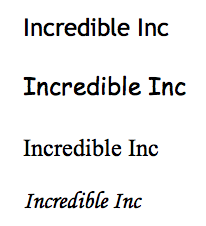 Here’s an example, imagine we’re trying to choose a typeface for a new company called, Incredible Inc. The first is Trebuchet, the second is Comic Sans, the third is Time New Roman, and the final one is some script font. Trebuchet looks clean, simple, professional and readable. Comic Sans is readable when it’s large, but doesn’t look clean or professional. Times New Roman is a bit cramped and busy. And the script is absolutely brutal to read. Do what you like, but using Helvetica or Trebuchet is an easy way to make text look visually appealing without having to build up all of the skills and experience necessary to understand design.